Developing new bearings without an adequate analysis tool is difficult. It generally ends up being a build-and-bust effort guided by intuition, superstition and back of the envelope calculations. This tends to be expensive and time consuming, and frankly, we don't have the budget for it (nor do most of our clients). Thus, we recognized very early on that Xdot needed a foil bearing analysis tool. After a great deal of research and planning, we decided to develop a finite-element based tool using an open-source finite-element framework. The goal is a modular, fully coupled, fluid-structural analysis code for both radial and thrust bearings. Leveraging work performed in support of our STTR and SBIR efforts, the initial phases of this code development effort have been completed. This fully-coupled analysis code combines a Reynolds element for the fluid domain, and shell element for the structural domain. Elements for both journal and thrust bearings have been implemented. Currently (summer 2011), this code is limited to solving the static problem (shaft position, load capacity , pressures and deformations). This code was successfully used to support the design of a small, novel foil thrust bearing . The next phase is to implement a variety of improvements, upgrade to a more recent version of the framework, then add the ability to compute dynamic coefficients. The final phase is expected to be the addition of a thermal model (energy equation) to predict operating temperatures and help address bearing thermal management. Although this code is being developed in the context of air lubricated foil bearings, it includes capabilities for liquid (such as oil) lubricated bearing analysis. 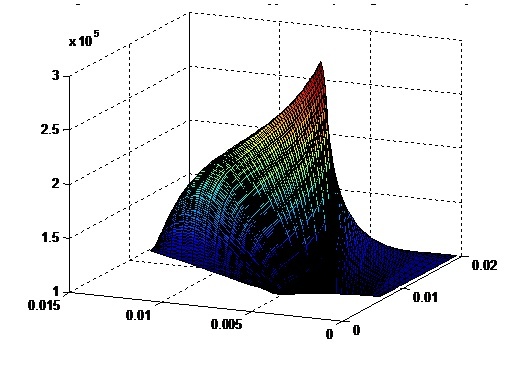 There is also the option of developing a new cavitation algorithm using the eXtended Finite Element method (XFEM). We believe that this approach would address some of the drawbacks of conventional analyses with regards to locating the cavitation boundary and addressing heat transfer in the cavitated region.